ST. LOUIS, 2018-Jul-30 — /Travel PR News/ — Vehicle selection, customer service and overall value were just a few of the categories for which National Car Rental received praise, taking the top spot for the fifth year in a row in Travel + Leisure magazine’s World’s Best Awards. In 2018, for example, Enterprise Rent-A-Car was named Canada’s top trusted automobile rental brand in the Gustavson Brand Trust Index for the third year in a row. 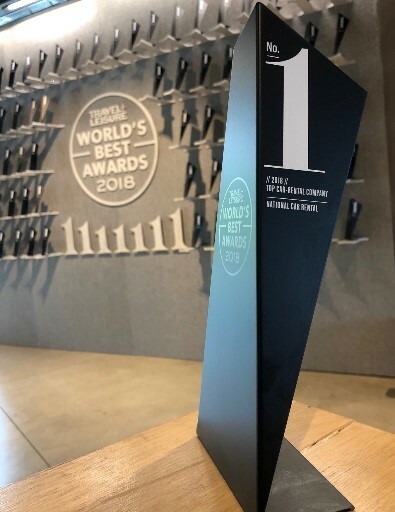 To top things off, the Temkin Experience Ratings awarded National with the Highest Customer Experience Among Car Rental Companies, and Enterprise Rent-A-Car was named Car Rental of the Yearfrom Omega World Travel. In 2017, Money magazine ranked Alamo and Enterprise as the two best car rental brands. Enterprise Holdings currently ranks as one of America’s Largest Private Companies, and if it were publicly traded, the company would rank on Fortune’s list of the 500 largest American public companies. In addition, among all North American car rental companies, it has the lowest leverage ratio and is the only one with an investment-grade rating. Other transportation services marketed under the Enterprise brand name include Enterprise CarShare, Enterprise Rideshare, Enterprise Car Sales, Enterprise Truck Rental, Exotic Car Collection by Enterprise, Zimride by Enterprise, Enterprise Flex-E-Rent and Enterprise Car Club. This entry was posted in Car Rentals, Transportation, Travel, Travel Awards, Travelers and tagged awards, car_rental, Don Moore, Enterprise Holdings. Bookmark the permalink.